We arrived at Keflavik airport tired ( the direct flight from Seattle leaves in mid afternoon, and with the time change gets in early in the morning so you miss out on the night), cold (somehow with all our traveling experience we assumed summer would be at least warm, not fully appreciating how seriously one should take the name ‘Iceland’) but excited. The airport is very organized. The excursion busses and desks, cafes, and cash machines are straight in front of you as you head towards the exit. There is no need to book any excursion from the airport beforehand; it can all be done right there. We had decided to go to the Blue Lagoon before heading off to the hotel in Reykjavik. The bus had a rocky start, when one piece of luggage fell out and had to be rescued; later we saw our luggage had been damaged so it wasn’t so humorous. 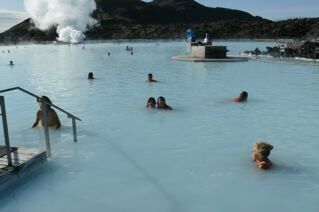 The Blue lagoon is a great place to start an Iceland trip, especially if you’re exhausted and freezing. The drive from the airport traverses some typical Icelandic lunar landscapes (after driving through some nondescript small towns where the driver seemed to be trying to rustle up some extra business at 8am on a sunday morning. Surprise, surprise – he failed.) and one arrives with a sense of great anticipation. Everything is organized – a place to leave luggage, lockers, a very well supplied changing room. And getting into that hot, soothing water is a real treat. The setting is wonderful and it’s a terrific place to start your trip. After an hour or so we’re ready to move on to Reykjavik. The bus service from the airport is amazing – airport – Blue lagoon – hotel. Unfortunately we all fall asleep on the way to the hotel and either we miss our driver’s call, or in my comatose state I don’t hear properly or (as we suspect) he skips us out completely. So we’re left in the bus with our driver who seems very unhappy to take these stupid tourists to their hotel a second time, but he does. We’re at the Hotel Bjork, a pleasant 3 star. By the time we check in (it’s noon) and get to the room, we decide we’ll nap for a couple of hours. After 2 hours of beautiful sleep we extend the rest first by 1/2 hour, then a 2nd 1/2 hour. But by 3pm I’m committed to getting out for a while. By now we need extra layers of clothes, and I’m already regretting our very light packing. 10 minutes later we’re downtown in the mostly pedestrianized Laugavegur, the city’s main shopping street. It’s a perfect day, lots of people out, beautiful blue sky (we forget to imprint that sky in our brains, not realizing we won’t see much more blue skies over the next 10 days), cafes, shops, bars everywhere. We decide today’s not the right time to try any really exotic Icelandic fare – puffin , whale, putrified shark – do they call it that to make it sound more desirable or to help save the sharks ?- and settle for the rather mundane tuna sandwiches. Then we stroll around some more, our 14 year old son looking at all kinds of souvenirs and trying on different variations of Viking hats. Eventually we’re too tired and head back for the hotel, stopping to pick up a variety of Skyr (yogurt) on the way. And then we’re asleep (although I find out in the morning my son stays up to watch Bruce Willis in Die Hard 2 on TV a few hours after discovering Die Hard 1 on the plane. So as we head into our trip, I know I’m in good hands.